Bore polishing and cylinder glazing is not clearly understood even by people who have been in the Motor Industry for decades. Both names are used to refer to the polishing or glazing effect that occurs in internal combustion engine cylinders under certain conditions. Cylinder glazing common symptoms are the loss of compression seal (which can contribute to more difficult starting) increased compression blow-by and increased oil consumption. In extreme cases it is necessary to dismantle the engine, restore the correct cross-hatch hone pattern to the cylinders, fit new piston rings, and adopt the correct bedding in procedure for the new parts. The most common cause is the polishing effect resulting from the hard carbon and other combustion chamber deposits building up on the piston crowns and ring lands, and rubbing on the cylinder walls at high speed. The cylinder surface becomes hard and shiny. In engines that exhibit high oil consumption and that have done a lot of work, evidence of blow-by can be seen as brown patches on the polished cylinder walls. Incorrect running-in procedure. Manufacturers do not run engines in these days, so it is the operator's responsibility to perform this procedure. The correct methods are set out in vehicle manuals. This applies particularly to diesel engines. They need to be put to moderately heavy work immediately, otherwise cylinder glazing can occur and long periods of idling can aggravate this condition. Cylinder glazing can occur as a result of the polishing effect of the long chain polymers used in modern engine oils as viscosity index improvers, particularly in multi-grade oils. Oil companies have eliminated earlier chemical friction modifiers from their engine oil, to lessen the problems which arose with the use of these ingredients. The Pro-Ma Fuel and Oil Additives MBL oil concentrate modifies friction, achieving this primarily as the result of microscopic copper and lead particles becoming embedded in sliding or rubbing surfaces of machinery. This provides a smooth surface to improve sealing and to reduce, but not eliminate, friction between the metal surfaces. This makes the oil concentrate different in its function from most other additives which are synthetically and chemically formulated. The Pro-Ma MBL oil concentrate does not cause bore polishing or cylinder glazing. In fact, it can often improve the piston ring sealing and heat transfer. With regular use at each oil change, the Pro-Ma MBL oil concentrate has been shown in most instances to reduce oil consumption, and combustion blow-by, unless the engine is worn to the extent that it requires reconditioning or replacement or has suffered mechanical damage. 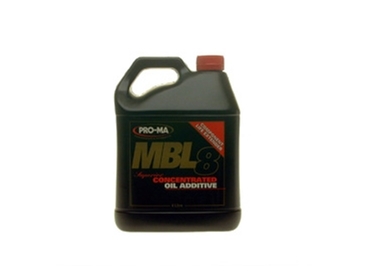 MBL oil concentrate is a superb product for improving and maintaining engines for long-term efficiency and reliability.